The second SURAM trip (Scripture Use Research and Ministry) will go to the Mengen language area (East New Britain, NT 2004), where there is reportedly low use of the translated NT. The team consists of six people from SALT (Marjan Sikkema and 5 PNGns: Carol Saferita, Fred Igami, Susan Sefayo, Keh Kudadi and Evelyn Kunda) with four from Language Resources: Crystal Davis, John Carter, René and Lydia van den Berg. The team will leave on Friday May 23 and return on Monday June 2. 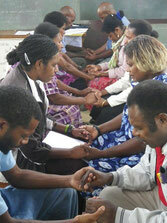 Please pray for accommodations in the right dialect area; building trust and relationships quickly; getting honest answers as to why the NT is poorly used; serving the Mengen community through some courses on family and marriage; giving the Mengen community a sense of ownership in the Bible Translation movement in PNG, and of course good health and unity among the team.